This campaign ended on April 04, 2017, but you can still make a gift to St. Lawrence University by clicking here! Login, share your personal link, and get 1 friend to make a gift, and you will get a handwritten note from a current student! The top 15 advocates who generate the most donors will be awarded a famous SLU Pub Cookie! Log in, share your link and encourage your friends to participate! Over the past 1856 minutes, 2,441 donors have demonstrated why it’s great to be a Laurentian. Thank you for making every minute count over the past two days. 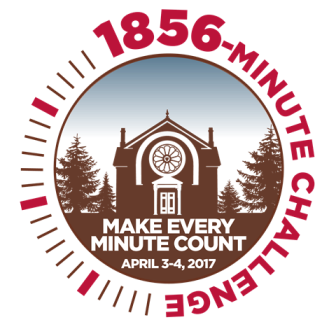 The 1856-Minute Challenge raised $324,111 plus an additional $500,000 challenge gift for a total of $824,111. Your generosity and time have enabled us to provide resources to ensure that the Laurentian legacy remains strong. A special thank you to our class and donor challengers as well as our generous anonymous Laurentian match donors. Your support, throughout the 1856-Minute Challenge, showcases your passion, commitment, and belief that St. Lawrence is a place that creates leaders and Laurentians for Life!